A talkfest among the foreign ministers of four countries held in Thessaloniki this week saw agreement on trying to come up with common solutions to the migration crisis – while, in a form of diplomatic speed-dating, the ministers also took the chance for bilateral meetings. Hosted by the Greek foreign ministry, the meetings on April 21 and 22 brought together Greece’s Nikos Kotzias, Bulgaria’s Daniel Mitov, Albania’s Ditmir Bushati and the Republic of Macedonia’s Nikola Poposki. The gathering spawned further meetings, with agreement to hold further quadrilateral meetings every six months and, if necessary, special meetings. All four foreign ministries issued statements on the various meetings, collective and bilateral. The Bulgarian Foreign Ministry emphasised that the four ministers agreed that the countries of South Eastern Europe will seek common solutions to deal with the migration crisis. According to the Bulgarian Foreign Ministry, the main objective of the Thessaloniki meeting was to strengthen dialogue and expand the prospects for further co-operation and co-ordination in addressing common challenges arising from migration and the refugee crisis. The ministers also discussed ways to strengthen dialogue and enhance border co-operation. Mitov, the Bulgarian Foreign Ministry said, emphasised the need for a clear distinction between refugees and economic migrants, adding that instruments for international protection and readmission should be respected. “The agreement between the EU and Turkey is an important first step in strengthening controls and the strengthening of the external borders of the EU,” Mitov said. In this area, fighting human trafficking and the disruption of illegal networks remained fundamental, the Bulgarian foreign minister said. According to a Greek foreign ministry transcript of the post-meeting news conference, Kotzias said that the ministers “feel the need to help towards the institutional development of our countries and ensure financing, the need to promote good governance in all countries of the region and strong democratic institutions”. “We have all agreed that we find ourselves in a process of reconstruction for tackling the major problems of our times, especially the refugee issue. We are learning how to better organise our co-operation and our co-ordination in an active way, in an effective way, in solidarity, based on our common democratic values,” Kotzias said. “We all want to co-operate in order to record and control the routes for the movement of populations, in the struggle against trafficking and networks of trafficking, to work together in order to find the correct mechanism for legal migration and how to tackle long-term problems,” the Greek foreign minister said. The foreign ministers, he said, also agreed that their co-operation was aimed at having “common principles, based on humanitarian principles, on humanism, on appreciating the different and the other, on safeguarding the security and safety of our citizens and on the stabilisation of South Eastern Europe”. 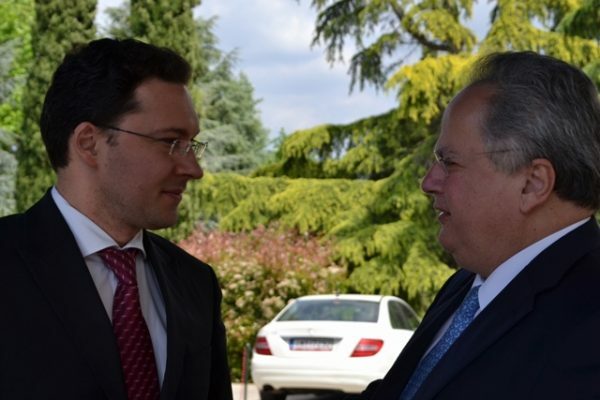 Kotzias said: “We all have to develop solidarity among us and mutual understanding, as well. We need further communication and frequent clarifications”. Those remarks by the Greek foreign minister might well be read against a background of some recent tensions over the handling of the situation at the Greek – Macedonian border. Kotzias’s further remarks are worth quoting at length. “We all agreed that we should contribute to the reform of the provisions in the Dublin Treaty. 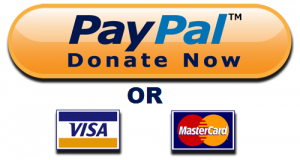 And that we should use NGOs in an organized way. Because NGOs can offer a lot, but we should make a list of these NGOs, in order to have a more coordinated evaluation of these NGOs,” he said. “To make our work successful, we agreed that we should support common and joint policies concerning Jordan and Lebanon. We should support the development of strategies regarding these countries from the point of view of the European Union and contribute, with all of our power, to the stability of Egypt. Because its geographical position, its geographical size, the fact that it has a population of over 97 million, of whom two thirds are young people, make it a very critical player in the future of the region,” Kotzias said. He said that the ministers also had agreed on the need to co-ordinate, by all possible means, with co-ordination and communication, “our control and our common action on the borders towards the return and relocation of the people moving in this region”. The April 22 meeting involving interior ministers had, Kotzias said, underlined the need for further cooperation among the intelligence services of the four countries that participated in the meeting. “We need to exchange information that has to do with the fight against organised crime and human trafficking,” he said. The ministers had looked into the agreement between the EU and Turkey from a particular point of view. “We have found that at this time Turkey has been implementing this agreement successfully, I would say. The people moving from Turkey to the Greek islands have fallen in numbers,” Kotzias said, but added that “bearing in mind that there might be some gaps in the implementation of this decision, a plan B is needed for emergency situations that might arise”. “Finally, in our meeting we also talked about security and safety issues which might be the issue for our next meeting. We also talked about terrorism underscoring that the refugee issue is not related with terrorism. Terrorism has to do with illegal networks and other factors that generate it and reproduce it,” Kotzias said. Macedonia’s Poposki told the news conference that “because of the reality on the ground, we wouldn’t be able to say that this migration crisis affects our relations towards east and west, meaning Albania and Bulgaria, to the same extent as does on the south on the Greek borders, because we have the reality of tens of thousands of migrants that are stationed there”. “And obviously it is easier to co-operate with both of our neighbours where we don’t have these masses of migrants coming in,” Poposki said. “Considering the situation and the reality and the gravity of it on the corridor south north, meaning all the migrants that are now crossing into Greece from Turkey and continuing their road upstream, I have to say that in 2016 we have moved in a situation where we do have a co-operation. We have seen 2015 without any co-operation whatsoever,” he said. Poposki said that communication channels had been established and were working, and added the sideswipe that this did not mean that automatically everything would be resolved: “we have to be conscious that still today activists, NGOs and human smugglers are co-operating across borders in an easier manner than state institutions do”. “We have to send the clear message that the road through the Balkans for the migrants is not going to see the same evolution as it has in 2015, but on the other side Greece should not be left to deal on its own with tens of thousands of migrants that are on Greek territory right now, and for that we need to work on readmission and relocation,” Macedonia’s foreign minister said. A question to Kotzias led to some pointed philosophical musings on the part of the foreign minister of Greece. “Foreign policy should have specific characteristics,” Kotzias said. “Foreign policy is not mass media. Foreign policy is not everyday activism, which I love and I adopt. Foreign policy is not political opposition discourse. “Foreign policy should have stability, certainty and should be flexible; it should be serious, it should be composed, it should be exercised in a sober way and in a decisive way whenever that is necessary. “I am saying this because, often in a great number of EU member-states, and in our country sometimes, we lose this clear way of thinking and sober way of thinking, in order for one person or another to create a soundbite or two seconds on a TV channel. “TV channels and newspapers do their jobs, but ministers of foreign affairs shouldn’t be interested only in promoting themselves, but they should try to promote a good climate of co-operation and stability with other countries, and mainly their neighbors,” he said. Kotzias also announced that in the second week of September, Greece would host on the island of Rhodes a meeting involving a number of EU member states, including Bulgaria, and Arab and Mediterranean countries. “The topic of this meeting will be security and stability,” he said. The Albanian foreign ministry’s statement on the Thessaloniki meeting quoted Bushati as reiterating the commitment of his country to be part of a common European solution based on a sense of solidarity as well as the capacity and will to keep the values, principles and respect for international law alive. “The qualitative co-operation between candidate countries and EU member states should be transformed into an opportunity to strengthen the political commitment and accelerate the integration process of Western Balkan countries,” Bushati said. Then there were the bilateral meetings. The Greek foreign ministry said that Kotzias and Mitov “discussed the political and economic relations between the two countries, the excellent level of bilateral co-operation, coordination of the two partners’ actions within the framework of the European Union, as well as co-operation with third states in the context of trilateral co-operation configurations and on a multilateral level”. The Bulgarian foreign ministry said that the emphasis in the talks was on the refugee and migration crisis in Europe. The two also discussed the fight against terrorism, implementation of the agreement between the EU and Turkey and suppression of human trafficking. 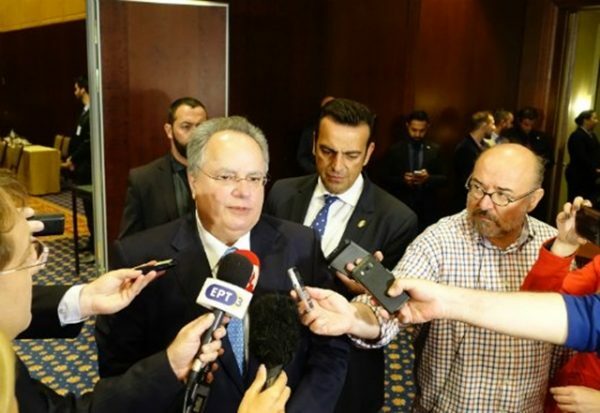 Mitov and Kotzias agreed to work actively to strengthen co-operation between Bulgaria and Greece, as well as between the countries of the region. The Bulgarian foreign ministry said that Mitov had, at his meeting with Poposki, urged all political leaders in Macedonia to resume political dialogue and seek common solutions to the current political crisis. First priority should be maintaining public order and internal stability, Mitov said, according to his country’s foreign ministry. He emphasised the need for a return as quickly as possible to implementation of the Pržino agreement – a reference to an EU-brokered June 2015 deal that had been intended to resolve the crisis that followed an earlier SDSM boycott of parliament over claims of electoral rigging, and that had been deepened by the wiretapping scandal. “Only in this way can the Republic of Macedonia maintain political stability, the rule of law and the integrity of the institutions, without which fair and democratic elections cannot be held,” Mitov said. 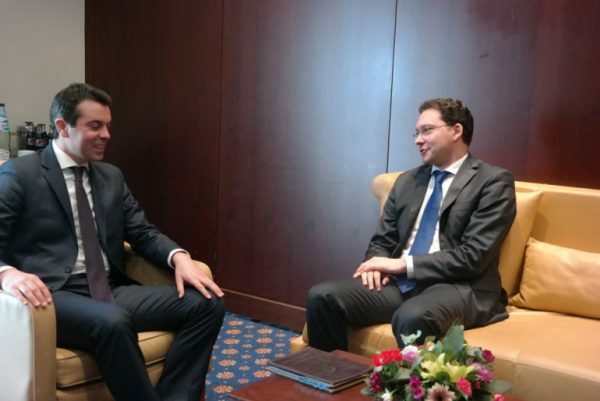 Macedonia’s foreign ministry summed up the meeting in a single paragraph, saying that Mitov and Poposki had discussed dealing with the refugee and migration crisis. “The support of Bulgaria for the European integration process of Macedonia was underscored, and expectations were expressed that as soon as possible a text of the treaty on friendship, good neighbourliness and co-operation would be agreed”. Greece’s foreign ministry said that Kotzias and Poposki “discussed issues concerning bilateral political and economic relations, the course of the implementation of the Confidence-Building Measures and political consultations, as well as the problems of the region”. The foreign ministry of Macedonia said that the two ministers expressed willingness to continue the co-operation related to the refugee crisis and migration as well as all other areas of mutual interest, especially in the area of border control and prevention of border incidents. They discussed topics of the meeting of the working groups of the two foreign ministries on confidence-building measures and a meeting scheduled to be held next week in Skopje. Special emphasis in this area was focused on co-operation in culture and education, about which, among other things, was announced the signing of a co-operation agreement between Athens and Ohrid universities. According to Albania’s foreign ministry, Kotzias and Bushati “dwelt on further pursuing communication on the already started process of addressing and finding solutions to all bilateral issues, the agenda of economic cooperation, regional developments and European integration of the Western Balkans. The parties reiterated the importance of carrying on with the dialogue between their countries’ governments, “in the framework of strengthening the spirit of mutual trust as well as the need to materialize action in order to advance towards the resolution of bilateral issues,” Albania’s foreign ministry said. According to Greece’s foreign ministry, “the subject of their talks included bilateral political and economic relations and co-operation in regional and multilateral organizations. 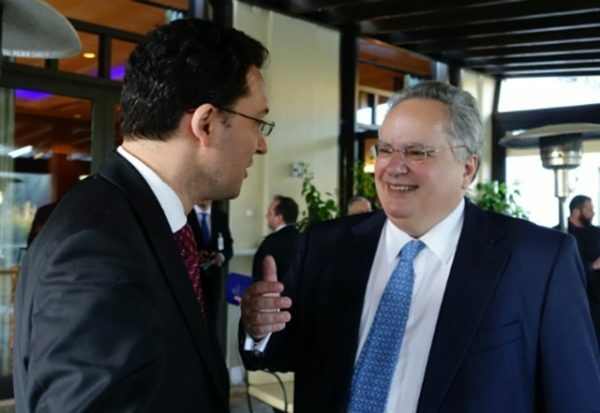 Mr. Kotzias also accepted an invitation extended by his Albanian counterpart to visit Tirana on a date to be determined via diplomatic channels”. 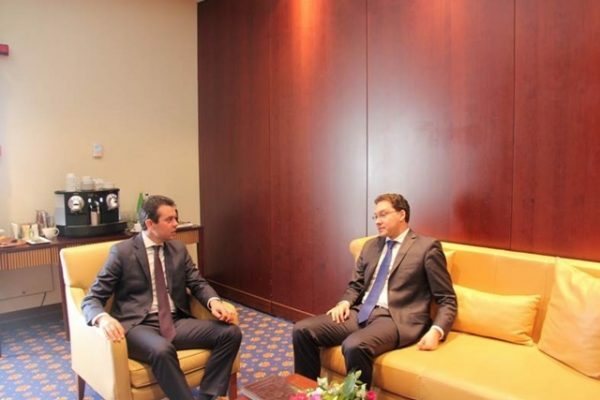 In the briefest statement of all, Macedonia’s foreign ministry said that Poposki had a meeting with Bushati.